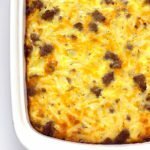 Easy Hashbrown Breakfast Casserole – Easy breakfast casserole with frozen hash browns, eggs, sausage and cheese. 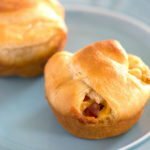 Can be an overnight, make ahead breakfast. 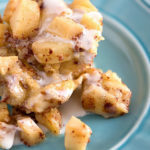 This breakfast bake is so versatile. It can be made in the morning when you are ready to bake it. Or, it can be completely assembled the night before. Add breakfast sausage to a large skillet. Break it apart and cook it until it’s completely brown. Drain off any fat. Add frozen shredded potatoes, the cooked sausage, and shredded cheddar cheese to a large bowl. Stir to combine. Then, transfer to a large baking dish. Add eggs, milk, salt, and pepper to a large bowl. Whisk until well scrambled. Then, pour the eggs over the hash browns. Follow the recipe directions to assemble this casserole. Cover the dish and place it in the refrigerator overnight. In the morning, uncover the dish. Let it sit at room temperature as the oven preheats. Then, bake it the exact same way as listed in the directions. The cooking time is the same either way. 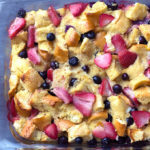 This easy breakfast casserole is a great make ahead breakfast or brunch recipe. And, it’s perfect for feeding a crowd. 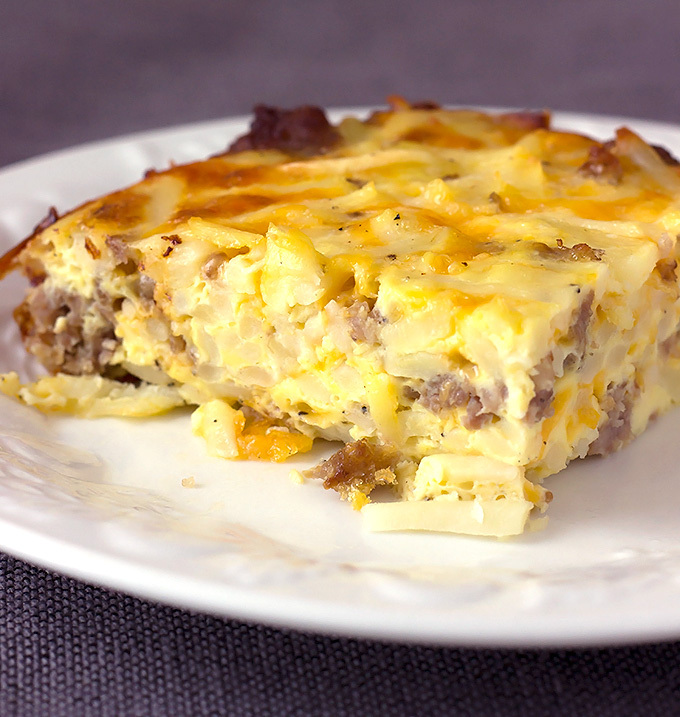 How to make a breakfast casserole with sausage and hash browns. Sausage Hash Brown Breakfast Casserole recipe. 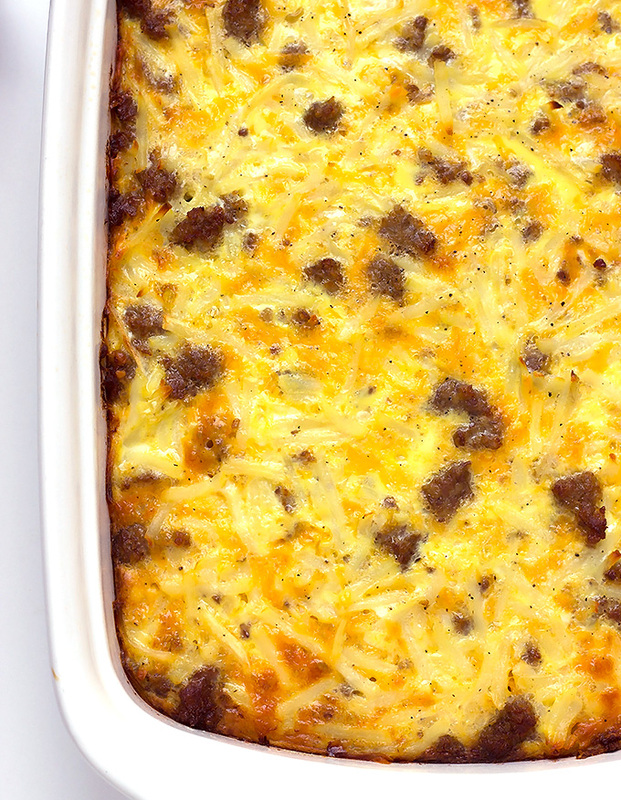 Eggs poured over hash browns, sausage, & cheese; then baked. A great make ahead breakfast or brunch recipe to feed a crowd. Preheat oven to 350 degrees Fahrenheit. Spray a 9x13 inch baking dish with cooking spray. Add the sausage to a large skillet and place over medium heat. Break the sausage apart with a wooden spoon. Cook until the sausage is completely brown, about 7 minutes, stirring occasionally. Drain off the fat. Add the frozen potatoes, cooked and drained sausage, and cheese to a large bowl. Stir to combine. Pour the mixture into the prepared baking dish. In a large bowl, whisk the eggs with the milk, salt, and pepper (I use the same bowl from step 3). Bake for one hour. The center should be set and the edges should be golden brown. 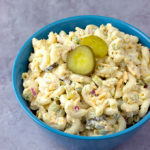 This casserole can be made ahead of time/overnight. Cover the dish with plastic wrap and store it in the refrigerator after it is assembled. Remove the plastic wrap before baking as directed in the original recipe (same temperature and time). Also, check out my Customizable Baked Oatmeal Muffins. Does this freeze well? 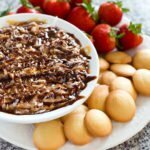 I am considering using this delicious recipe for meal prep. 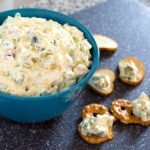 I just recently tried out this recipe as a freezer meal. I actually split the recipe between two disposable foil pans (so that is 6 servings per pan). Then, I cooked one for the week and froze the other pan for next week. I defrosted the frozen pan for a day in the refrigerator and then I cooked it using the exact same instructions as posted above. Turned out great! ?? Sorry, if this is a dumb question, but you cooked it and then froze it, or froze it uncooked? Can l defrost it in refrigerator the night before? Will that be long enough? to defrost it, place it while frozen in a pan or bowl big enough for it to sit in.. Fill the bowl with COLD water making sure no water goes into the food. Let it sit on counter. It will thaw quickly. I do this with frozen meat too. Place the meat into a sealed baggy and place in a bowl of cold water. Such a classic breakfast casserole recipe. Love it! Make ahead breakfasts are the best! This casserole would be a big hit in my house. Could this be made two days in advance?